I've come across a few Pointers that were 'barking' down the years but you have to go to Finland to see a real barking pointer in action. 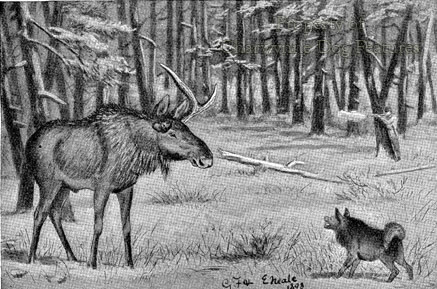 The thick forests and the climate there and the absence of ground scent from feathered game led to clever dogs being developed to firstly locate the hunter's quarry and secondly to 'hold' it until the human hunters arrived. The Finnish Spitz has an instinctive skill for finding roosting birds and then 'detaining' them until the hunters catch up, using a mesmeric bark-howl that fascinates the birds and transfixes them. It is a smart way of hunting feathered game in sub-arctic conditions. These dogs have to be good on air-scent, possess the necessary hypnotic bark, have a weatherproof coat, strong feet and a very determined nature. There are hunting trials for such dogs all over Finland, leading to the national hunting trial finals in October each year, which last two days and involve a 3-4 hour hunting test. Any hound, even one acting as a gundog, capable of working successfully in sub-Arctic conditions, treacherous mountain terrain and in huge expanses of largely uninhabited regions surely demands our admiration. Why then have the ‘spitz-hounds’ not attracted our interest? Books on hounds usually overlook the Northern breeds, which can range from the Elkhounds of Scandinavia to the bear-dogs of Karelia. Somehow the appearance of such hounds, with their prick ears, thick coats and lavishly-curled tails, doesn’t immediately fit our mental image of a scenthound and certainly not that of a gundog. The popularity of the Finnish Spitz in its own country has led to over a thousand a year being registered with the Finnish Kennel Club. 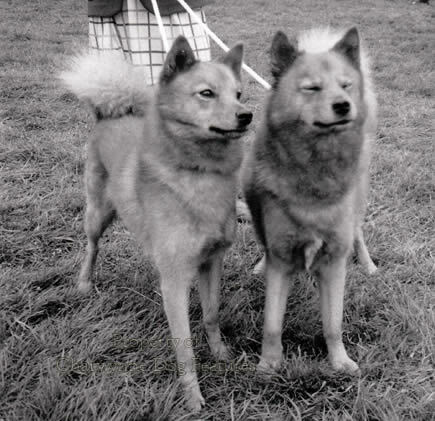 Originally introduced here in 1920, but almost disappearing during the Second World War, the Finnish Spitz is now quite we ll known here, with 36 newly registered with the Kennel Club in 2010, but only 10 in 2011, and 13 in 2013. They have been grouped with the Hounds by the KC, but as a ‘bark-pointer’ should perhaps be allotted to the Gundog Group. 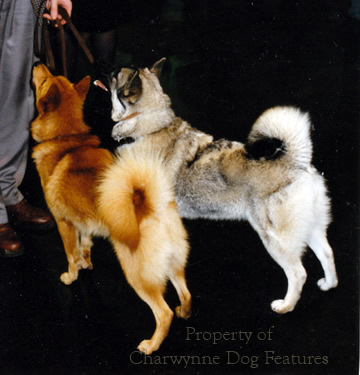 In their native country, the Finnish Spitz cannot become a full champion without its working or trials certificate. This attractive little breed is a most unusual one, for us, that is, a hunting dog, in a style not utilised in Western Europe. The dog is used in heavily wooded areas where it uses sight, scent and unusually good hearing to locate feathered game, upland game such as grouse or capercaillie. The location of the quarry is ‘pointed’ by a special stance, four-square with tail up twitching with excitement, head back and giving voice – a distinctive sing-song crooning bark, which is sustained, both to mesmerize the prey and guide the hunter. This ‘point by bark’ has to be audible to the hunter, who may be some distance away, and more importantly to ‘freeze’ the bird. The Finns claim that the tone of the bark, the agitated almost hypnotic waving of the bushy tail – and even the small white spot on the dog’s chest, hold some kind of fascination for the bird, which watches intently from the relative if temporary safety of its perch. There are similarities here with the flamboyantly-waving tail of the old red decoy dog of East Anglia, used to lure ducks for the hunter, and now exemplified in the Nova Scotia Duck-tolling Retriever, also in a red-gold coat. The Finnish Spitz has the same rich rufous, almost red-gold coat, sensitive mobile ears and a highly inquisitive nature. 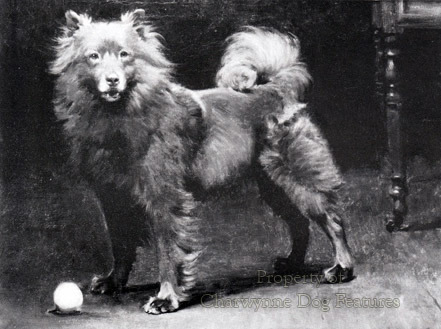 The national dog of Finland, with a written standard going back to 1812, the breed originally tracked larger hoofed quarry such as bear and elk, now the task of the Karelian Bear Do g, the spitz concentrating on feathered game. Around 18 inches high and weighing just over 30lbs this game little breed is favoured here as a companion dog but their barking talents need curbing in a household pet. Not for nothing are competitions held to find the 'King of the Barkers' each year, although Finnish forests are notoriously dense and decibel-levels matter to the roving hunter. In Finland, the breed is rarely seen in towns but many live in isolated hamlets and villages. Also introduced into Britain and even more specialist is the Norwegian Lundehund, used to hunt puffins on coastal cliffs. 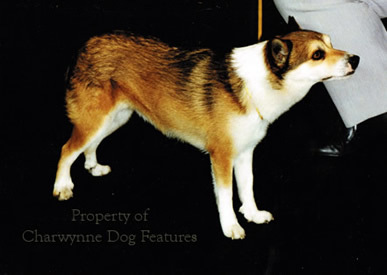 Uniquely, this breed has the ability to fold its ears shut, using a cartilage around the ear-rim, and, six toes on each foot, rather than four. Hunting for puffins’ nests clearly demands extra features in the hound! 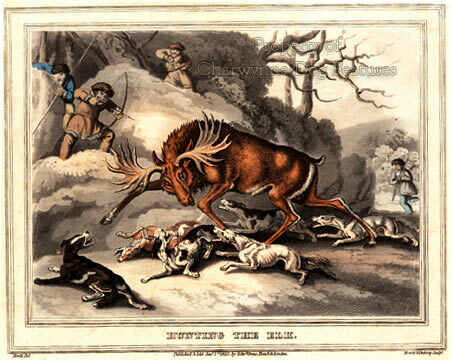 British field sports have long been dominated by the gun and the hound. The increased range of the gun led to the unemployment of the decoy dog. Perhaps the future value of such clever gifted dogs as bark-pointers, decoy dogs and puffin-finders lies with field scientists rather than field sportsmen. Finding and indicating roosting or nesting game has long been a distinct canine talent and one to be utilised in our increasingly instrument-led world.